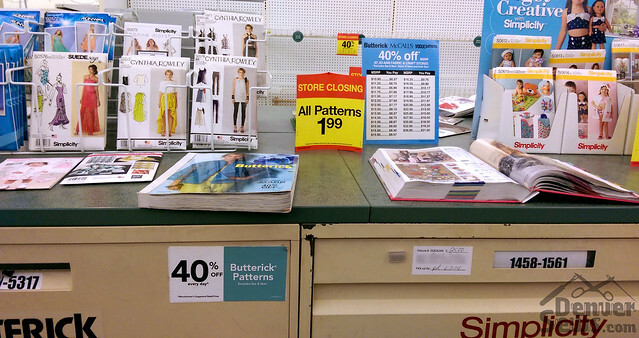 Some news for Denver folks – the Joann’s in Westminster is having a “closing” sale. (Don’t worry, they’re just moving to another building in Westminster and selling everything off rather than moving it.) I stopped in on Saturday because I heard they were selling off the fixtures and I wanted a pattern cabinet for cheap. (Yes, my pattern collection is embarrassingly large.) Unfortunately for me some guy had showed up before me that morning and bought the whole row of cabinets! 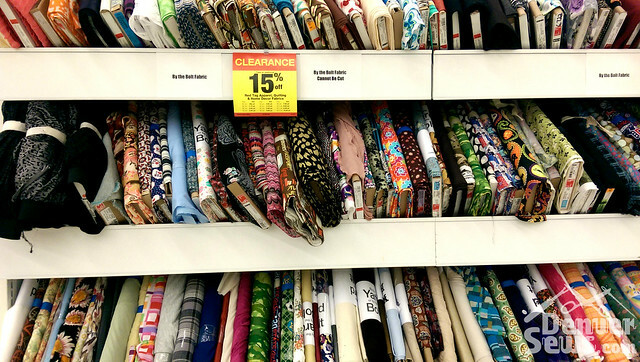 Good news first… all patterns are on sale for $1.99. 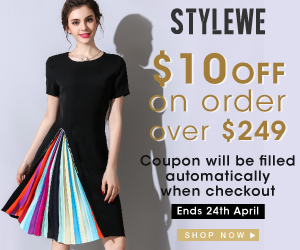 That a great deal for Vogue, Burda, Kwik Sew and New Look patterns which never go on sale for less than $4-$5. I bought a small stack of Burdas. All notions and non-fabric things are on sale for 40% off. It’s not that great of a deal considering you can always get 40% off an item with a coupon. Even so, a lot of the notions were picked over already. The fabric unfortunately is only marked down to 33% off, or 15% off if it is already considered on sale. In the red tag section all the bolts have been wrapped up and marked with the yardage, and you can only buy the whole bolt. In that case, 15% is not a great deal if you have to buy 7-8 yards of it! An employee at the cutting table showed me the mark down schedule and the next mark down will be happening Sunday June 15th. The schedule said 50%, so I’m not sure if that means only 25% for on sale and red tag items? After that there is a mark down every two weeks, and I think they went to 75% and 90%. On Sunday, July 13, from 2:30 to 5:30, we will be hosting a Fabric Swap! Bring whatever you no longer love and swap it for what you can’t live without! Or, give your extras away! If you have nothing to swap, come anyway! You are clearly Under-Stashed and might stumble on to something great! All fabrics that are unclaimed as of 5:30 will be donated to the Rosebud Indian Reservation. NOTE: None of the store merchandise will be a part of the swap. However, the store will be open, just in case you need to find a lining or buttons to go with your new treasures! Geez it’s like dealing with crack pushers, these fabric store owners, waving their pretty fabrics under our noses.Like we can resist. No shame. Ya, I was there as late as Saturday and there were tons of patterns left. Picked up more pant patterns from Burda. But, I need one more from Butterrick, really just one more. But, honestly just this last one. Then I’m done. Oh, and I’m going to reply to myself here, but Vogue, Vogue! for 1.99 might as well just buy the entire 2014 book at that price. Patterns are what I purchased, also. As you mentioned, the companies whose patterns are never at $.99. Got some good ones! The new store sounds nice and like it will be in a better location! I picked up some patterns. Amazingly all clothes. We’ll see if I actually ever make them. I haven’t been very impressed with the big 3’s accessory patterns in quite a while. We had a nearby Joanns relocate some years ago. On the last few days I remember scooping up patterns at 20/$1, and thread at 10/$1. Fixture wise I chose some of the wooden poles for home decor fabric bolts at 50 cents each. They became curtain poles in my new home! 20/$1 – wow! I’ll have to go back just before they close and see what the buzzards have left.